If you’re looking to head out into the wilderness for an extended period of time, you definitely need to make sure you have the proper equipment. As you might know, hiking boots are listed as one of the most important equipments you would need to take with you. However, you have to make sure that they are high quality and that they are going to get you anywhere you want to go, but that’s not always easy to do. So, how can you find the best backpacking boots? You’ll need a little bit of help of course, and that’s where we come in. If you’re looking for boots, you need to know what they are made of and what they are going to do for you. They should to be high-quality in order to give you the comfort when walking long distances, especially if you will carry a heavy backpack with you. For that reason, we’re going to talk about some of the most important aspects of backpacking boots and also what you need to know in order to make sure you’re choosing the right ones that will help you while performing any outdoors activities. The first thing you have to look at is the material of the uppers for your chosen pair of boots. You want them to be high quality and capable of resisting the bad weather and a whole lot more. You should make sure that they are made with some type of leather or waterproof material that will keep your feet warm and dry. There are a variety of different materials, including full-grain or split grain leather, Nubuck leather and a waterproof membrane. If you’re not so sure about these materials you can also opt for a vegan friendly material instead. There are really only two different types of midsoles in a pair of hiking boots that you can choose from. These are going to improve the amount of cushion that you have, but some are going to be more comfortable than others. You can get EVA or polyurethane and which you prefer will be up to you. EVA is usually a little lighter and a little more cushioned as well as being less expensive, but if you’re really looking for a lot of support you’ll want to consider the polyurethane instead as they can be much more durable for longer periods of walking. 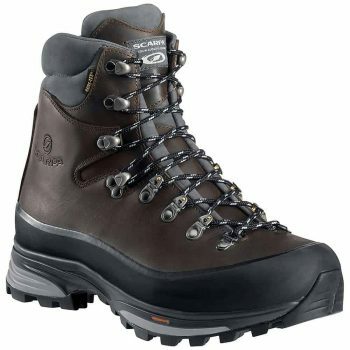 All hiking boots will use rubber on the outsoles, though that rubber may include different types of additives to make them more secure and durable. What you’re really looking for in this instance is the lug pattern and the heel brake. You want plenty of traction, which means deep-set, thick lugs to provide you with plenty of grip. You also want them to be wide-set to get rid of mud and debris they might otherwise pick up. With a heel brake you want a good distinction between the front of the foot and the arch to aid in steeper descent. There are really only two different types of internal support that you’ll find with backpacking boots. These boots can have shanks, which are between 3mm and 5mm with some stiffness in the midsole to give more load support. These may cover all or part of the midsole. On the other hand, plates can be included with shanks or not and will fit between the shank (or midsole if no shank) and the outsole. They help provide just a little bit more support against rocks and other rough things you may step on in the woods. 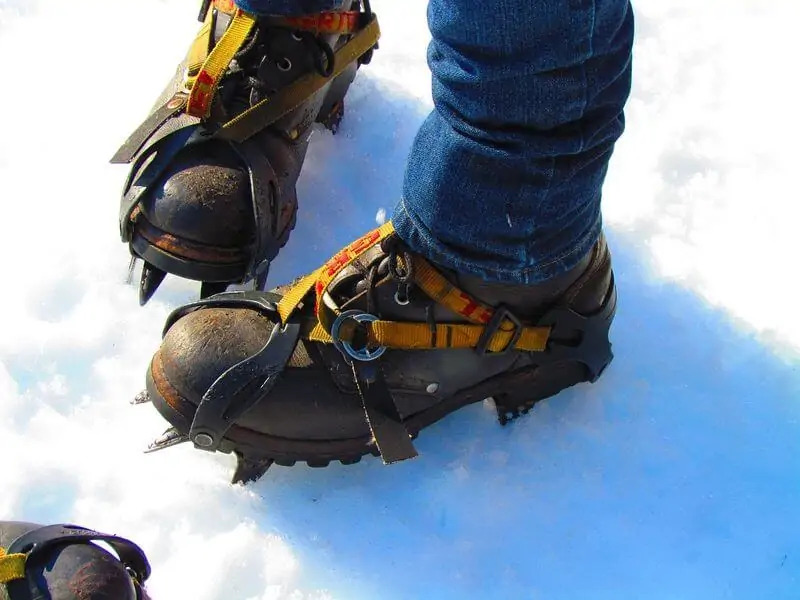 If you’re going to be hiking, backpacking or mountaineering in areas where there is a lot of rocky ground or steep climbing, you may have to use crampons. This is going to allow you to climb more carefully and successfully. You won’t have to worry about slipping or falling while you’re on the mountains. You’ll be able to climb easily and you’ll be able to continue on with your adventure without having to worry about damage or danger on the way. If you try to climb without crampons you could end up in danger, after all. The specific style of the boots you choose is going to be entirely up to you. You want something that will fit you comfortably and allow you to easily maneuver through woods, trees, mountains and a whole lot more. You have to make sure you can wear them comfortably and also that you can move in them and climb. You don’t want to get out in the middle of the trip and realize that you don’t like your boots. Now that we have explained important aspects about backpacking boots, it is time to show you our selection. Description: If you’re looking for a pair of boots that will help you travel through the woods or even the mountains with no trouble at all, then you’re definitely in the right place with the Scarpa Kinesis Boots. They’re made with Nubuck leather uppers to keep them waterproof and sturdy no matter where you go and a Gore-Tex lining to make sure you’re comfortable at all times. Not only that, but the cushioned collar makes them more comfortable around your ankle while still fitting tight and the micro-pulley hardware means that they’ll tighten up just the way you need, so there’s no slippage. 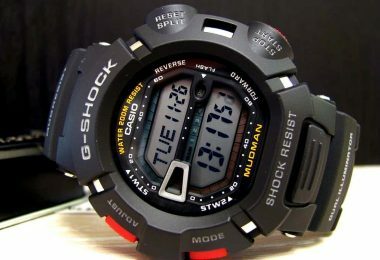 Also, they have a wide set style that ensures mud and rocks will slide off easily. However, people say that the boots are a little large, so they are not true to size. Additionally, they say that the upper shoe string hooks are pretty weak; and that they feel a little stiff. Related: For climbers, we recommend the Scarpa Origin Climbing Shoe. They are made with a lush leather material; they have a flat profile that makes them very comfortable; and they have a hook-and-loop closure to keep the foot warm and well-positioned. Description: If you’re looking for a pair of boots that are going to help you the next time your family wants to take a hike, these Salomon Cosmic Boots may be just what you’re looking for. They have a very casual style with a canvas exterior and Gore-Tex lining, which means that they are water resistant. 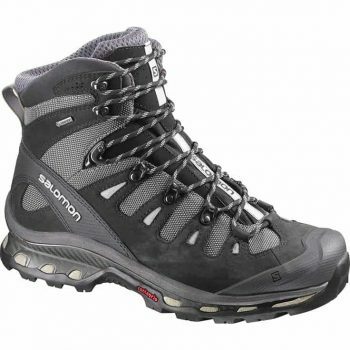 These boots also have a small arch for more support while providing plenty of traction for hiking over rocky areas. Though they’re not designed for more extensive hiking or heading out in less desirable weather, they can be used for daily wear as well as during mild trips. These boots come in several sizes and have an ergonomic fit to women’s foot shape and size. They come about to ankle height and lace firmly up the front to provide a tight fit easily. Some buyers have said that the boots are too small. In fact, people had to go up one whole size to get the perfect fit. Also, they say that they do not keep the water and debris out; and that are quite heavy. 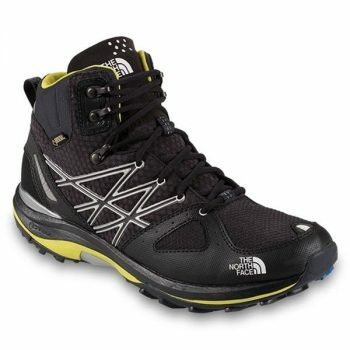 Related: As an option to make these boots waterproof, you can get the Salomon Low Trail Gaiters. It is made of a durable and stretch fabric; it is very breathable and it has a easy on/off hook-and-loop closure. Description: These The North Face Ultra Fastback Boots are designed for shorter trips where you’ll need some traction and support. They have a moderate amount of traction on the bottom and you will not feel discomfort or problems while wearing them. These boots have a unique design that’s intended to help you walk properly and keep you aligned even when you’re traveling in less than desirable conditions or rough terrains. With superior comfort, they’re intended to make you enjoy your time in the outdoors without having to worry about slipping, or falling. 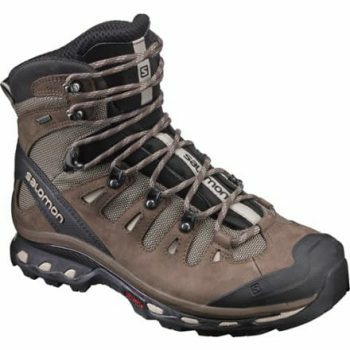 Nevertheless, buyers have said that these boots do not offer a lot of protection against extensive climbs in rocky areas because of their type of traction. Also, they say that they are not waterproof at all and that the rubber nubs are weak. In fact, some people had to glue them after 8 to 10 hikes to keep them usable. Related: With The North Face Unisex Borealis you will no longer worry about having a resistant backpack for your trips. It is constructed with a suspension system that guarantees comfort during the entire day; it has a easy-access side pockets; and it has a 25-liter capacity. Description: If you’re looking for some less expensive hiking boots that will get you through your next backpacking trip with ease, then the Asolo Fugitive Boots will do just that. They are made of leather upper that provides a waterproof and tight fit up to the ankle, while the laces on the front are secured to keep them firm while you’re walking. 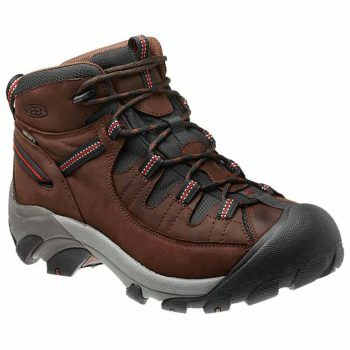 These boots also have a lug-style sole with large and wide enough markings to keep you going over difficult areas and different types of terrain. The boots are breathable, flexible and lightweight, so they provide comfortably over an extended period of time, no matter if you use them in the city or in the backcountry. People who have used these boots say that after a while – 12 to 15 hikes – the soles started to separate from the bottom, considerably reducing its traction. Also, they say that the laces are so weak that they break in no time; and that the stitching on the inside back of the heel is so wide that it causes discomfort. 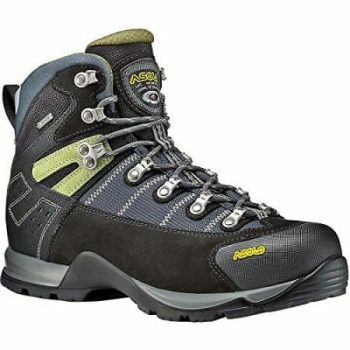 Related: The Asolo Men’s Agent GV Hiking Shoes are pretty useful when hiking since they are water resistant, their soles have a natural shape; and their interior is made of a Gore-Tex material, making them comfortable. 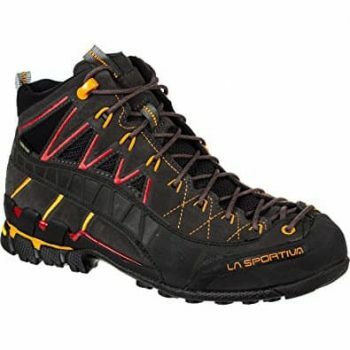 Description: The La Sportiva Hyper Boot is definitely uniquely designed, but in a very positive way. The laces up the front are designed to stay tight no matter what, and the shoe itself fits just around the ankle to give you a little more support while walking. There’s a decent amount of tread on the bottom to provide you with plenty of traction through the Sticky Idro-Grip outsoles which are designed to help you get a grip on just about anything you come across out there on the trails. Also, these boots are waterproof and will keep warm and dry while you’re walking for longer periods of time in less than desirable weather. One major downside that these boots have is that they are too tight and people with big foot might found them uncomfortable. Additionally, people say that the stripes of the heel are made of a poor material; and that the booths themselves do not last long. Related: We also recommend the La Sportiva Mercury Sweater Top since it is made of polyester, has a pull on closure and is long sleeve, which makes it really comfortable. 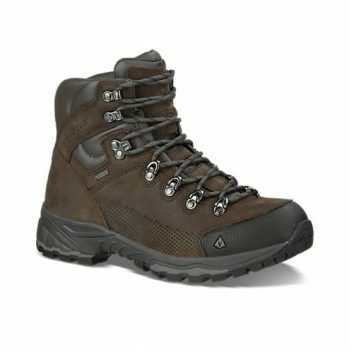 Description: The Keen Targhee Boot is designed to keep you comfortable and warm no matter where you are going through. They have a leather and textile upper that fits all the way to the ankle, as well as a rubber sole that is designed to withstand rough terrain. Also, they are lightweight and comfortable. The multi-directional lugs mean that they can get a good grip while also getting rid of dirt, rocks, mud and other debris that often gets stuck in the treads of your boots. The hydrophobic mesh interior lining keeps your feet dry while the outer membrane ensures that your feet still get plenty of air. Since these boots are quite cheap, it is more than expected that they will not last long In fact, people said that after seven months, they started coming apart. They also say that the sole is not firmly attached to the rest of the shoe, that they do not keep the water out; and that they come smaller than they should. Related: The Keen Men’s Newport H2 Sandal is what we recommend when it comes to water shoes. It provides the classic airiness of a sandal with toe protection; it has a razor-sipped sole for traction; and it is made of a washable polyester. It uses high quality treads to make sure you won’t slip and fall on rocks, and also has a rubber toe cap to protect your feet further. The high fit of these boots ensures your ankles are protected as does the cushioning located in this upper area. The interior is filled with Gore-Tex to keep your feet warm and dry while you’re walking as well. Nevertheless, the soles are not as durable as they should since users have said that they started separating from the heel after the fourth day hiking. Also, they say that it is not waterproof and that some people may find it too stiff. Related: For those who does not own a good backpack yet, we recommend the Salomon Advanced Skin Backpack. Thanks to its design, you will barely notice you have it. It made of an elastic fabric, so it is breathable, it can be stretched and wrapped around you and it keep things as close as they can be. However, users say that these boots are a bit tight, which makes them really uncomfortable. Also, they say that they do not last long since their laces are weak and that they are not as waterproof as the company let you believe. There are a lot of boots that you can choose from. Some of them are better than others. Hopefully, after reading this article, you would be better at choosing the best according to the material they are made of, the support they offer to give you comfort, and so on. So, start checking out the options and see what you can find. And while you’re at it, let us know, what are your favorite hiking boots? Why do you keep going back to them every time? What’s your favorite trip you took them in? How well are they still sticking in there for you? Share your thoughts on the comments!